Year after year, the fitness industry is subject to an endless stream new gadgets, tools and training methods, all claiming to be complete solution to all your training needs. I am often skeptical whenever a new product comes into vogue, especially when it promises to be the only tool you need. The reality is that no one tool is a complete solution, and in many cases, your training tools and training methods will depend on your intended goal or outcome. The reality is that most new training tools and gadgets are just fluff. It is pretty hard to beat the usefulness time tested tools like barbells, dumbbells, kettlebells and the like. So where does the mace fit into training landscape? Is it a weighty piece of fluff destined to collect dust in some corner of the training floor? The answer is no of course simply based on the title of this blog post; but this will point will be better understood the moment anyone picks up the mace for the first time. I still remember the first time I picked up and tried to swing a mace. A friend and fellow Agatsu trainer Charles Robert was in town visiting from Quebec City and we were spending the afternoon together playing around with kettlebells and Indian clubs. Charles had brought a 6kg mace with him and I was eager to give it a whirl. I was quickly humbled after having a hard time swinging the mace and even doing something as simple as keeping it stable in my hands. My grip was very quickly taxed during my efforts and all kind of bells of excitement were ringing off in my head as I tried to figure this damn thing out. I was very used to training with kettlebells and managing uneven loads, I had great stability and grip strength. This should have been easy, but oh boy it was not! The mace challenged me in some very specific ways that no other tool had before and I immediately saw that value that it could bring to my training, When Charles returned to Quebec City later that day, it was without his new mace as I forced him to sell it to me so I could continue explore this new mace world! When evaluating the utility or any tool or training method for the first time, some great questions to ask yourself are: does this help to fill a hole in my training? Can I accomplish something with this tool that I can’t with anything else? Anyone that has pressed a kettlebell before knows that it is very different then pressing a dumbbell. Because of where the weight is distributed, your shoulder stability will be challenged in very different way; this is a good thing! So what make the mace unique? What can you do with the mace that you can’t easily do with other tools? The first element to consider is rotation. For most people, their training rarely takes them out of the sagittal plane. They incorporate little lateral movement and little or no rotational movement in the average session. One major challenge of the modern age is that we spend far too much time seated. Wouldn’t it be a good idea then to include some movements that takes us out of the sagittal plane and move our bodies in ways of which we do not during the our day? The mace can help accomplish this! If you consider the nature of athletics and movement, staying within the confines of the squat rack with your feet firmly planted a hip distance apart will not have the greatest transfer to the types of challenges or movements that will be undertaken on a court or field of play. The bread and butter classical mace movements like the 360 degree Swing or the 10/2 help to develop rotational strength and power in a spectacular fashion. There are very few tools if any that are as well suited to rotational training as the mace is. In many sports rotation is also generally only undertaken in one direction. Over time this kind of repetitive motion can create imbalances in the body. Mace training can provide an away to train rotation in multiple directions, helping to build balanced strength. If you are training to perform in a sport with rotation (basically all sports), wouldn’t it make sense to incorporate some rotational training into your routine? Closely tied to this is the concept of anti-rotation. One of the most important things to maintain while swinging a mace is the spinal position and midline stability. It should not look like the body is doing some distorted dance while the mace swings before your back; one should work to maintain a neutral spine, prevent the ribs from popping and elbow flaring out – the midline should remain stable throughout the movement. This necessitates maintaining a level of abdominal stability throughout the movement to maintain proper alignment. The carryover of this lesson into athletics and the field of play is both immensely for both performance and injury prevention. Planks and the like are a great way to train stability and teach the concept of anti-rotation, but not in the same dynamic fashion that the mace can. A third important concept to appreciate is that of leverage. There is a reason that a light 6kg mace was so hard to manage on my fateful first encounter. With a mace, the majority of the weight is concentrated in the its head. Simply holding the mace upright in front of the navel and executing a few squats can be quite challenging for your stability and grip! Once again, there is no other tool that will replicate this task. This leverage can also be incorporated into different exercises such as presses, overhead squats, hollow holds, deadlifts and rows. I am not suggested that doing Romanian deadlifts with a mace will replace the place of the barbell in terms of maximal strength; however, your abdominal and hip stability will be put to the test with a light weight mace in this movement in a way that must be experienced to be understood. The versatility and portability of the mace should also be appreciated. Beyond the kettlebell, I cannot think of another training tools that will provide you as much versatility and opportunity to put together a full body workout with the countless variations of pushing, pulling, squats, hinges and carries that can be done with once single implement. 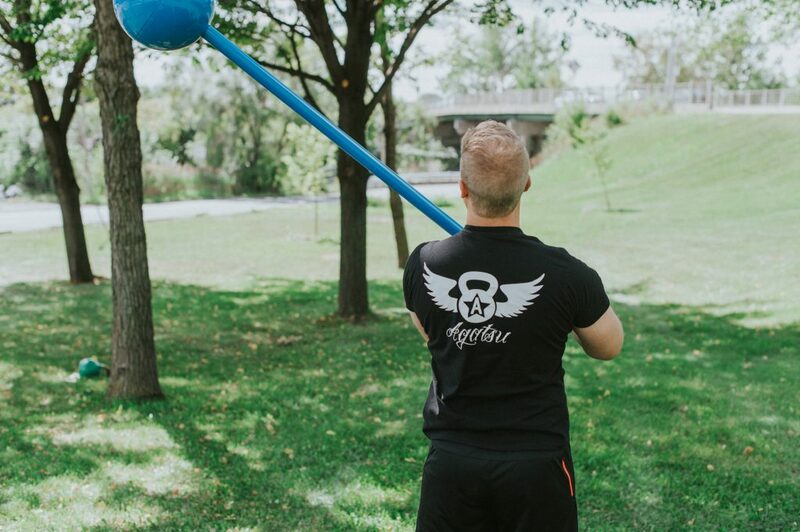 You can easily throw a mace in the trunk of you car and know that no matter where your adventures take you in life, you will always be able to get a good workout in. Leverage work can be a great way to work both strength and stability while the rotational swinging can be a fantastic way to challenge your endurance and power. Your bases are covered with a mace on hand. There are many other benefits to consider when it comes to mace training and the fact that this old school training implement is beginning to enter the mainstream is a sign that its utility and usefulness are being recognized and honored. Will the mace help to fill some holes in your training? Will it bring some benefits that other tools cannot? The answer is yes on both accounts. A final thing to note is that while there are some unique benefits to swinging a mace, it is also just plain old fun! You feel like a Viking warrior badass the minute the mace comes into your hands. In an age when the image many people hold of fitness is walking mindlessly on a machine in front of a television like a zombie, it is nice to know that there are others out there embracing a classical tool that will bring a multitude of physical benefits to their training, and also help to prepare them for when the zombie apocalypse comes.